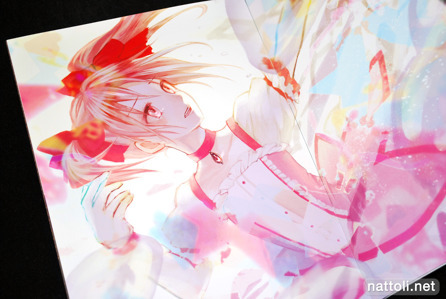 While looking for Puella Magi Madoka Magica illustration doujinshi, I encountered several new artists along with an event titled Magi Madoka ONLY - Mou Nanimo Kowaku Nai (魔まマ オンリーイベント～もう何も恐くない～) that ran for just one day on April 24, and was strictly Madoka doujins only. 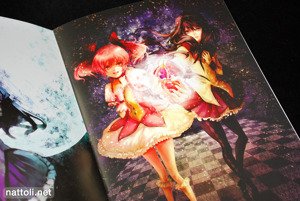 Jem & Lights Puella Magi Madoka Magica Fanbook by Sugi (スギ) was one of the many releases, and it presents a full color collection of Madoka art. 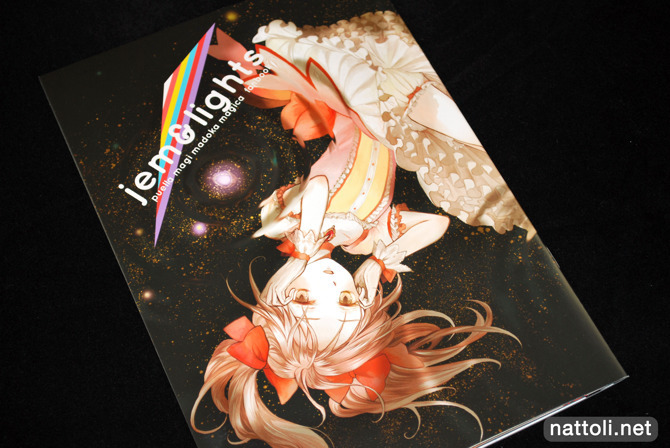 Jem & Lights is B5-sized, staple-bound and 20-pages long including the covers. All of the illustrations by Sugi are two-page spreads, so there really aren't a lot of illustrations. But the ones that are there are easily some of the best works Sugi has done. Sugi's Madoka works focus on the darker side of the series which allows for a selection of rather dramatic art works. In total, there are 5 two-page spread illustrations, one for each of the girls if you don't count the cover. 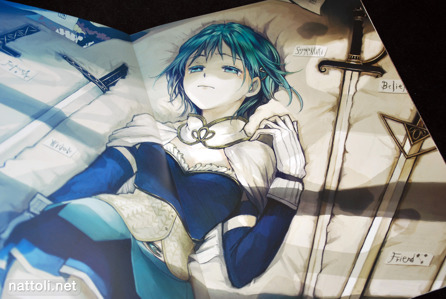 My favorite is the one of Sayaka Miki, labeled like a magical girl specimen alongside her swords. Mami Tomoe's illustration, which can be seen on Sugi's Pixiv is also well done, but it's quite a familiar scene. The two guest artists are Haicha and OrGA, each contributing a single page illustration. The last few pages of the book include artist comments from both the guest artists and Sugi, along with a thank you message. 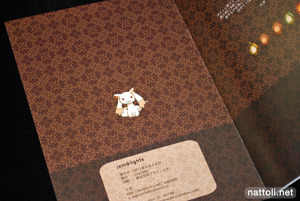 Jem & Lights Puella Magi Madoka Magica Fanbook is a nice collection, although it's short. All in all, it's a nice way to start what will ultimately be a flood of Madoka doujins come Comiket 80!